The seeds for the current Perry Wellness Center were first sown in 1999, when the Tom Perry Peer Center was established. Named after Stuart Perry's father, the program was the first free-standing peer center in the state of Georgia. Under the auspices of the Peer Centers of Georgia, the program operated through funding and oversight by the national MHA and local Middle Flint Behavioral HealthCare. Stuart Perry was instrumental in the planning and development of the Tom Perry Peer Center, but did not become involved in its day to day leadership until 2007, because of his national advocacy efforts. In 2007, the program was re-established as the Perry Wellness Center, with an increased focus on wellness activities and a holistic approach to peer services. Formed as a 501(c)3, the center now operates under the governance of its Executive Board. The Perry Wellness Center functions as a peer-founded, peer-run center for individuals with mental illness and/or addictive diseases. After over a decade of transitions, the program now occupies a large campus in the heart of Americus, Georgia's historic Rees Park area. The program is growing daily -- in enrollment, activities, and facilities, at its several-acre complex. When the center re-opened its doors as the Perry Wellness Center in 2007, a total of five consumers were enrolled for services. Today, 54 peers attend the program, with services provided by 15 employees and consultants. Mental health programs throughout the United States have drawn on the advocacy and training efforts of the center and its founder, but the center is proudest of its impact on local communities. In 2009, the Perry Wellness Center was named the Peer Program of the Year in its home state by the Georgia Mental Health Consumers Network. It has also received a Community Enhancement Award for its efforts in Americus and Sumter County. Perry Wellness Center founder and national behavioral health advocate Stuart Perry began his own "Journey for Life" almost 30 years ago. At the age of 21, he was witness to the suicide of his father, who suffered from depression. For years after, Stuart struggled with feelings of loss and his own depression, but was not diagnosed until a psychotic break in 1989 led him to mental health treatment and a diagnosis of major depression. After hospitalization, medication, and group therapy, Stuart began his road to mental health. This past year, he celebrated 20 full years of recovery. Since his illness brought him to the brink, Stuart's journey has been one of advocacy -- promoting the importance of recognizing mental illness, as well as the value of treatment. Prior to establishing the Perry Wellness Center, Stuart worked with the Mental Health Association (now Mental Health America) and Middle Flint Behavioral HealthCare in a variety of roles: consumer specialist, case manager, public speaker, and advocate. Stuart came to national recognition with his Journey for Life, a walk from Americus, Georgia, to Chicago, Illinois, sponsored by the Mental Health Association. The purpose of the walk was to deliver a message about mental illness recognition and treatment to the American Medical Association. Armed with thousands of petition signatures and accompanied by hundreds of other walkers at different points on his journey, Stuart spoke to mental health and civic groups at every stop along the way. With the support of such advocates as former First Lady Rosalynn Carter and Habitat for Humanity co-founders Millard and Linda Fuller, Stuart became a national face for mental health recovery. 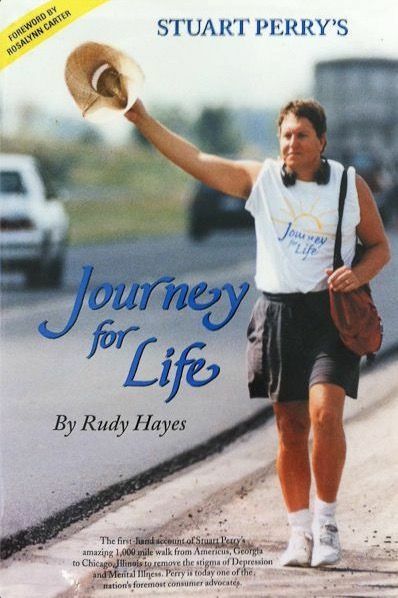 The story of his journey is captured in the book, "Journey for Life."